Two teams will take to the pitch at Mourneview Park this afternoon looking to make history for their clubs. The names Warrenpoint Town and Ballinamallard United are two sides no-one would have expected to be in the semi-final of the Tennents Irish Cup. Both clubs are living the dream as they prepare to battle to make it through to the final - yes the final of the Irish Cup. The other semi-final between Coleraine and Crusaders has a more familiar ring to it - but this last four clash will mean so much more to Warrenpoint and Ballinamallard. Both teams may never make it to this stage of the competition again - but they can dare to dream - and both will know that victory today will give them a chance to go down as legends of their clubs. And what makes it more romantic is that both sides had horrendous starts to their league campaigns but have recovered and are now within sight of an Irish Cup Final. And both managers have worked their magic. 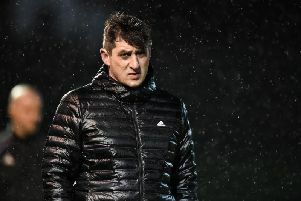 Ballinamallard boss Harry McConkey seems to have been around longer than tea - but he is still churning out the results. If ever a man deserved to walk a team out on Cup Final day it is Mister McConkey. But Warrenpoint’s Stephen McDonnell also deserves his day in the limelight. He is new to the management game but he has worked wonders at Town. It will be quite an occasion so good luck to both.